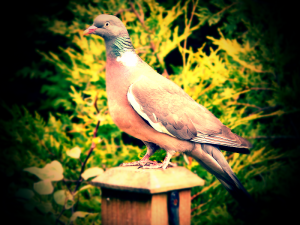 Wood pigeon - a tasty source of protein and a destructive pest. If you are going to hunt birds like wood pigeons for food you need to be aware that it is not as simple as you may think. Firstly, you need to make sure you have read and are familiar with the UK’s General License. It is free, but there are local variations depending on whether you are in Scotland, England or Wales. You can get a copy of the license from your local government agency and the links are at the bottom of this page. The license is basically a legal document that lets people carry out a range of activities relating to wildlife. Although you do not need to apply for a general licence, you are required by law to abide by its terms and conditions. This next bit is important. All British birds are protected. You cannot just shoot them for food. We have sought advice on this from the British Association for Shooting and Conservation, and our chat was really interesting. Pigeons are one of the most destructive causes of agricultural damage to crops, so are pest number one, but if you shoot them for food, it could be you who ends up getting roasted. The key words here are “Pest Control”. Our advice? Get permission from a landowner to help their pest control efforts. That way the resultant wood pigeon could end up in the pot legally. If you are interested in game birds during the open seasons, you should contact a local shoot and join for a fee. You may also need to apply for the relevant gun licenses, but they are often more than willing to help organise this. Finally, a good tip from the BASC; it is worth contacting your local shoot anyway, as you never know, they may be more than happy to give you a brace of pheasants after a shoot. Two pheasants for showing interest and support for an outdoor activity? Game on.